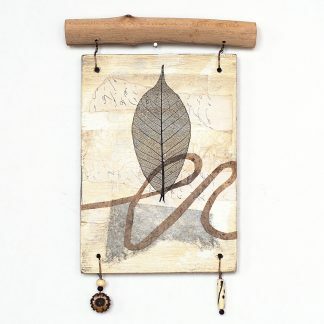 Small rustic mixed media art wall hanging, two reclaimed plywood panels with red and blue birds, combined with a found natural aspen branch and laced together with wire and beads. Wire is a blue steel finish, beads are bone and wood. The back is also painted. Total height is approximately 10″ (25.4 cm), width is approximately 5″ (12.7 cm).